This was supposed to be Tyler Toffoli’s breakout year for the Los Angeles Kings. At several times this season, that synopsis has held true and it seemed like Toffoli was on the fast track up the NHL’s scoring hierarchy. But, for what seems like as many flashes of greatness for Toffoli this season, he has disappeared on the ice for the Kings just as often. Los Angeles went into last off-season with one major priority, get their rising star to sign the dotted line on a new contract. 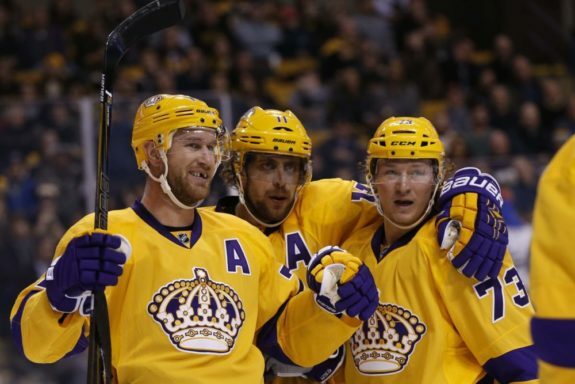 The Kings did just that when they signed Toffoli to a new two-year contract worth $6.5 million before this season. There it was, Toffoli had his bridge deal and could now take on the role as one of, if not the top, offensive threat for the Kings. There was no outside contract negotiations to distract the forward, it could be all hockey. If only it were that simple. The 23-year-old is in the midst of a career year, he has set new highs in goals (29) and points (54) with six games to play. While that is great, Toffoli could be at a much higher level. Much of Toffoli’s production this season has come in bunches, where he has strung together various point streaks. 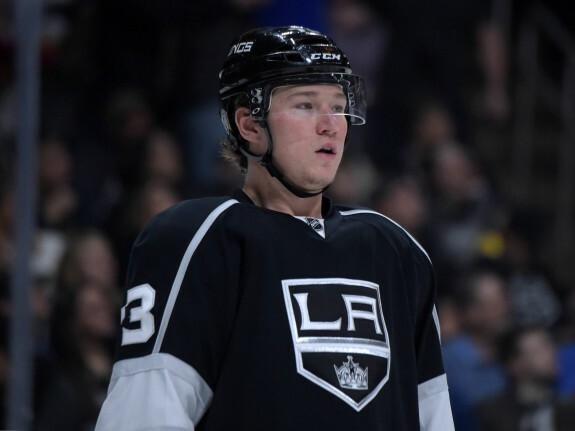 However, much like his production where his name becomes a regular on the score sheet for a period of time, Toffoli’s number has also played a vanishing act and disappeared from the score sheet for prolonged periods of times this season as well. Toffoli has had point streaks (to be clear a point streak starts at three games, not two) of four, six, five, four, and four games this season. Over the course of those 23 games, Toffoli scored 16 goals and grabbed 30 points. That is 55 percent of Toffoli’s goal and total point production coming in just 28 percent of his season. On the other side of this, Toffoli has had streaks of seven, five and three games where he has been held without a point in a game. Overall, Toffoli has been held off the score sheet 35 times after 76 games played this season, that’s 46 percent of his games played. Sprinkled in those games where Toffoli’s offense was thwarted are games where the Kings could have used an extra jolt of offense. In two games against the Anaheim Ducks this season, Toffoli has been held pointless. The Kings lost both of those games by one and two goals. A goal from the Kings’ young stud could have swung one, if not both, of those games the Kings’ way and could have reshaped the race between the Ducks and Kings for first place in the Pacific Division. An interesting note about those streaks where the Kings have been without a point from Toffoli for a prolonged time, the Kings have gone 11-3-1 in those games. While the Kings may still be performing well and ultimately getting the ‘W’, which is the important thing whenever a player is asked about point streaks or dry spells, this is something that is holding Toffoli back overall. Photo By: Andy Martin Jr.
47 overall pick of the 2010 NHL Draft is having a career year, has scored nine power-play goals this season, is shooting at just over 14 percent and is averaging over 17 minutes of ice-time a night. 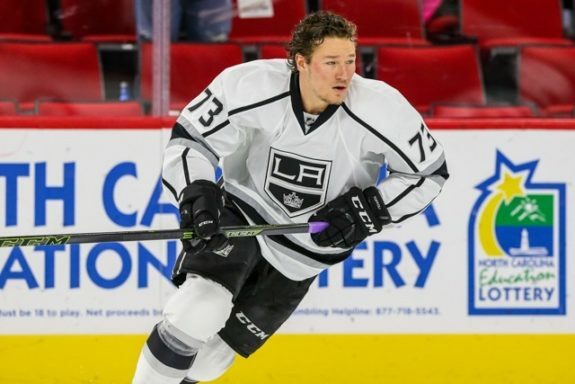 Now the next step for Toffoli is to find a way to be a factor night in and night out on the ice. If Toffoli can find a way to break up some of those pointless streaks and find a way to get his number on the score sheet in some of those 35-pointless games, he’ll get to that next level in the scoring race on both the Kings and in the NHL overall. The NHL’s elite find a way to produce as frequently as possible. Chicago’s Patrick Kane, who leads the NHL in points, has gone pointless in only 18 of his 77 games played this season. San Jose’s Joe Pavelski, who rounds out the top five in points, has been held pointless in only 28 of his 77 games played. Toffoli is just a step behind. Anze Kopitar, who leads theKings in points with 68, has been held pointless only 27 games this season. Toffoli is just a step behind. Until Toffoli can get the scoring touch figured out, he will sit behind players like Kopitar on the Kings and float around the 50th spot in the NHL’s scoring race.